Committed IPA is an imperial IPA from BJ’s Brewhouse. I had a chance to give it a try as we were coming home from a function that forgot to server food to the people attending. There are a few that denigrate BJ’s beer, but I have found that it has some really good qualities and I was excited to give this a try. They came out with this in 2015 and it is back for the fall of 2018. It took a few minutes for this beer to come out to the table as the waiter said that they were switching kegs. This seems to happen to me a lot. I guess I am just lucky. The last monthly IPA that I reviewed from them was the Temple of Stone IPA. This double IPA had a much bigger hop kick and to fair not even comparable with the Temple of Stone which was a wheat IPA. 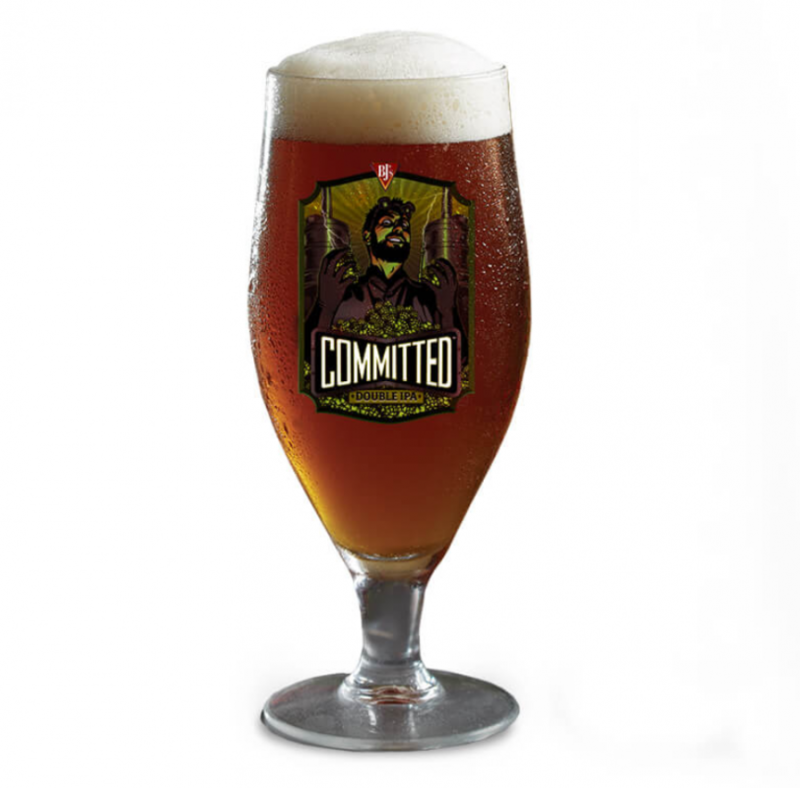 The Committed IPA was a 95 IBU kick you in the face almost 9% (8.6) ABV beer. And you tasted it. I know that they say it is smooth and drinkable, but on the first drink I would not say so. Even the waiter warned me about the hops. Which was nice. He knew his stuff. There are a few craft beer people who really think that they know craft beer, but really don’t. After that first drink, I settled in. The head is really fragrant. I had my wife give it a sniff and those citrus notes were apparent on her face. When you first take a sip it is alcoholic. That 9% is very noticeable and I even mentioned to her that my second beer would be something lighter as I was driving. That sweet first sip ends with a bitter beer face if you remember the old Keystone beer commercials. The same Keystone before they started to infringe on Stone Brewing. That bitter beer face is not a bad thing though. It is just really strong as this IS a double IPA after all. IPA’s are not drinkable in general and you have to like that hoppiness. You will not want to drink a 6 pack of this, but you will really enjoy the first one. I found that the sweetness is really nicely offset by the combination of the Columbus, Crystal, Simcoe and Cascade hops. The lacing of the off white head was perfect on the tulip glass. Although very sweet and malty, the finish was very crisp and not what you might expect. Some have said that the sweetness sticks around, but I did not find that to be the case. I see how one might say that because there is very low carbonation which sometimes enhances the malty part of the beer. Overall, 3.7/5 would be my rating for this.